The 1937 version of the Robb Wave Organ. Image; National Music Centre,© 2016 National Music Centre, Calgary.AB. The Robb Wave Organ designed by Morse Robb in Belleville, Ontario was an early pre-cursor, and said to be musically superior, to the Hammond Organ. The instrument attempted to reproduce the sound of a cathedral pipe organ by amplifying sounds generated by a similar tone-wheel mechanism. Robb based his tone-wheel design on that of Melvin Severy’s ‘Choralcello’ but with the addition of amplification – which wasn’t available to Severy at the time. Morse Robb’s miniaturised tone wheels of the Wave Organ. From the collection of the Canada Science and Technology Museum, Ottowa, Ontario Canada. Robb’s aim was to miniaturise elements of previous huge tone-wheel designs (‘Coralcello‘ of 1909 and ‘Telharmonium‘ 1897-1917) to create a practical, easy to maintain and affordable electronic organ. This was done by reducing the size and number of the tone wheels by adding a system of gears and increasing the number of notes on each wheel by ‘doubling and redoubling the wave forms on the discs on one shaft’ . 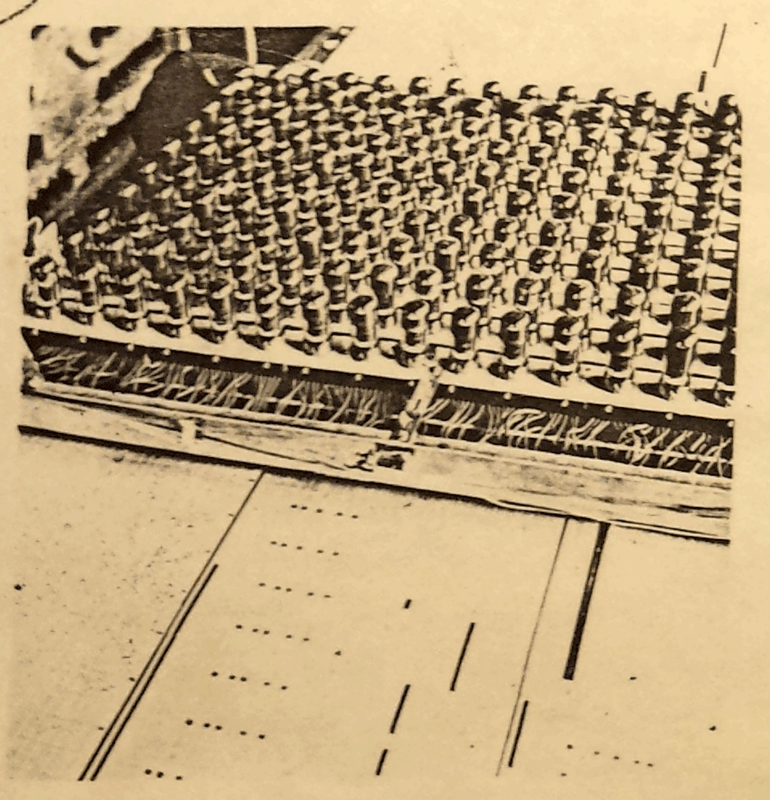 The instrument was equipped with twelve tone wheels representing each note, the ‘character’ or timbre of note – corresponding to organ stops and photographed from a cathode ray oscillograph – plus the harmonics of each fundamental note. The variation in pitch of each note was achieved by changing the speed of the tone wheel’s rotation giving the Wave Organ a total of five octaves. The tone wheels spinning within a magnetic field generated a voltage output of each note which was made audible by being passed to a valve amplifier and loudspeaker. Tone Wheel housing of the 1937 version of the Robb Wave Organ. Image; National Music Centre,© 2016 National Music Centre, Calgary.AB. The prototype Wave Organ was built in 1927 and premiered in November of the same year at the Toronto Daily Star’s CFCA radio studio in Belleville and patented in 1928 (1930 in the USA). 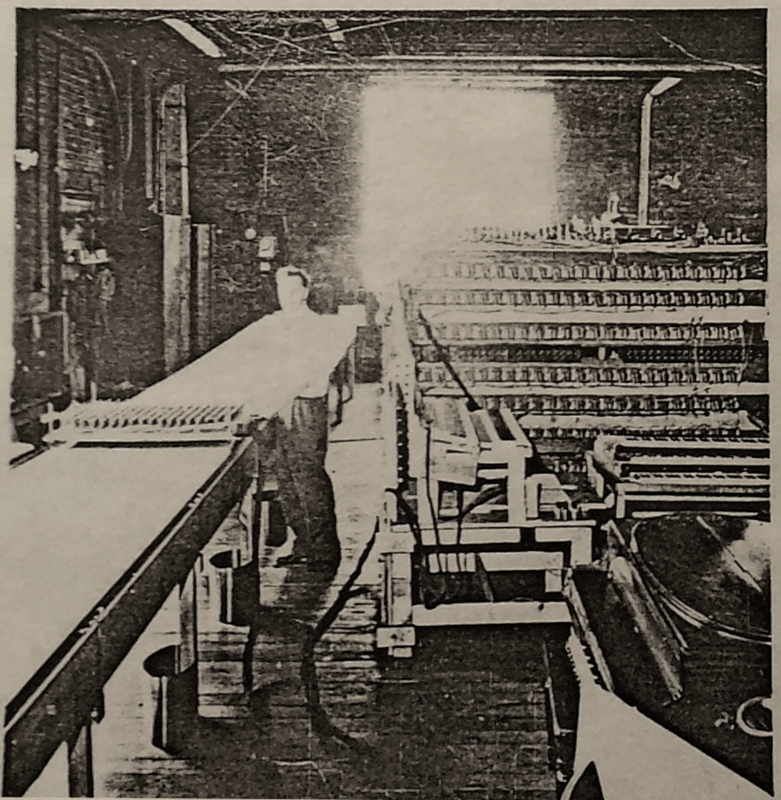 Robb planned to market the instrument by arranging a production contract with the General Electric Company in Schenectady, NY and later, organ builders Casavant Frères in Canada, however the worsening economic troubles of the 1930s depression permanently stalled the agreements in the spring of 1931 . Undaunted by the commercial failure of his first prototype, Robb produced a new, two manual, 32 note version of the Wave Organ in April 1934 and launched the ‘ Robb Wave Organ Company’- incorporated on 21 September 1934 – to market and sell the instrument. The first productions models became available in July 1936 and was publicly demonstrated at Eaton’s department stores in Toronto and Montréal. Despite an initial positive reaction Robb was unable to obtain funding for further production and in 1938 he abandoned the project – Only thirteen models were ever sold and the Wave Organ was taken off the market in 1941. 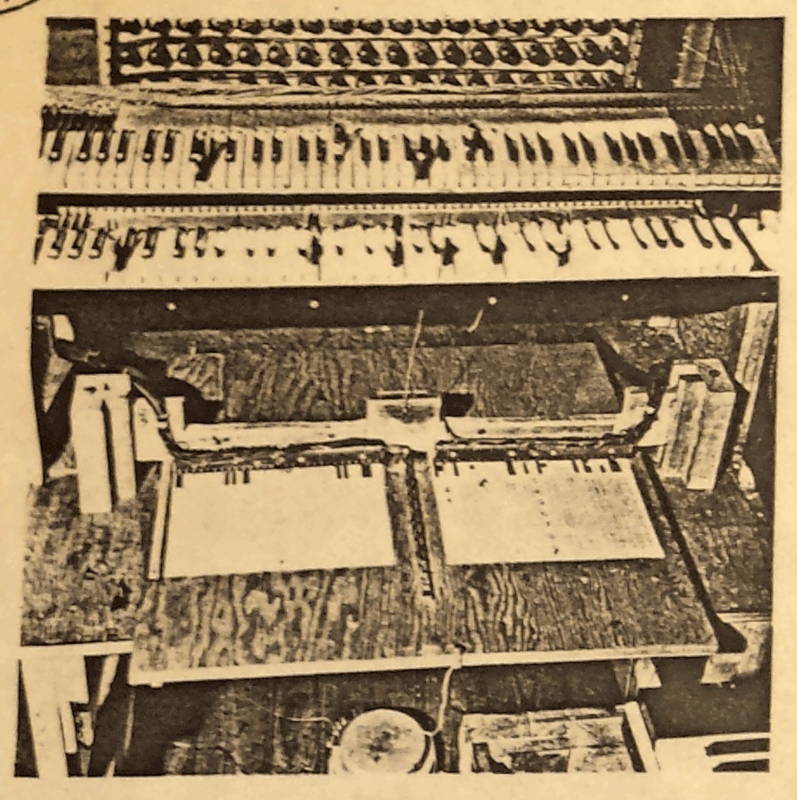 The Robb Wave Organ was more expensive than other electronic organs of the period – notably the American Hammond Organ, which used an almost identical tone-wheel technology – and sales suffered because of World War II. The last remaining Wave Organ prototype is preserved at the Canada Science and Technology Museum in Ontario. Robb studied at McGill University from 1921 to 1924 and then returned to Belleville where in 1926 began research on the Robb Wave Organ. 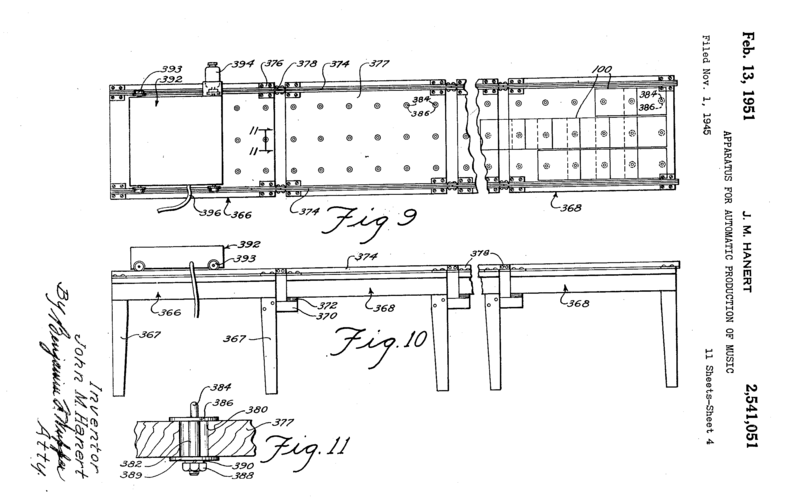 After the commercial failure of the Wave Organ, Robb applied his talent as an inventor to devices for the packing of guns during the Second World War. He became vice-president of his brother’s packing company and won acclaim as a silversmith. 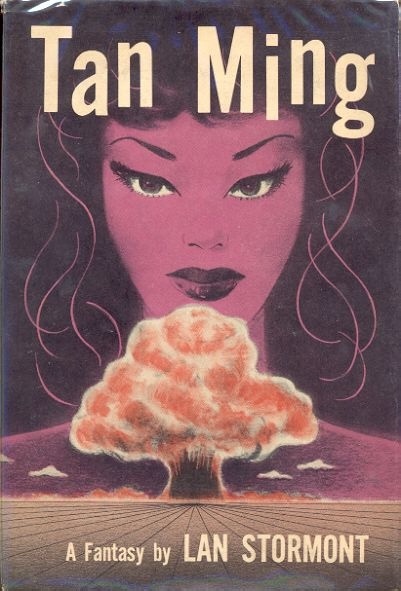 He also wrote a Sci-Fi -post nuclear holocaust novel Tan Ming (1955) under the pseudonym Lan Stormont (“An amusing fantasy in which a department store window dresser falls in love with a robot mannequin and manages to conjure into its body the soul of a princess named Tan Ming from a postholocaust future.”). A 1942 photograph of the Electric Automatic Orchestra at the Hammond Sound Studio, Chicago with john Hanert at the controls. Showing (L) the ‘Time Sequence’ table and scanning carriage and (R) a bank of some of the vacuum tube tone generators. Photograph; Private collection of Douglas Jackson 2017. 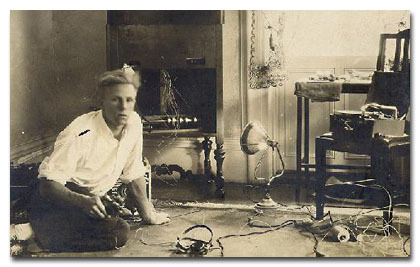 The result of Hanert’s experiment was the Electric Automatic Orchestra; a large, room sized machine installed at the Hammond Instrument Inc. sound studios at 2915 North Western Ave Chicago Illinois. The basic function of the machine were divided into three parts; a composition ‘Time Sequence’ table where the composer could write musical notation into the machine, a synthesis module which created sounds from the notation, and an output – in this case a lacquer disc-lathe to cut master recordings. 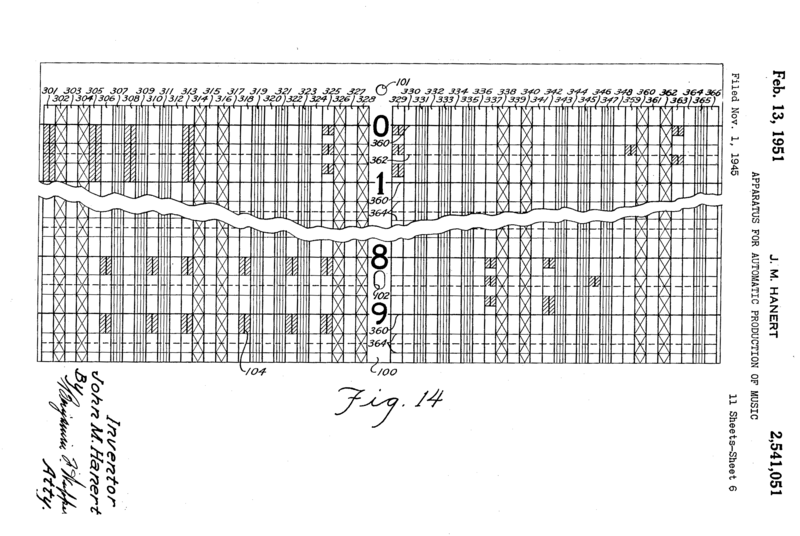 Hanert’s design enabled the composer to a create ‘perfect’ compositions by writing, erasing and re-writing the music on the ‘Time Sequence’ table – which could be done on or off-site or as required. Once this perfect composition had been achieved, the machine could make a final run and cut a master recording to disc to be used for mass production. The record notation cards were pre-printed with a grid like template and could be marked to represent individual note pitch – measured in quarter tones, envelope, timbre, vibrato, position in the bar and volume as well as overall instrument volume. The final tempo of the piece could be controlled by simply varying the speed of the rail driven scanning carriage as it travelled along the table or paused, reversed or ‘looped’ by control marks on the cards. 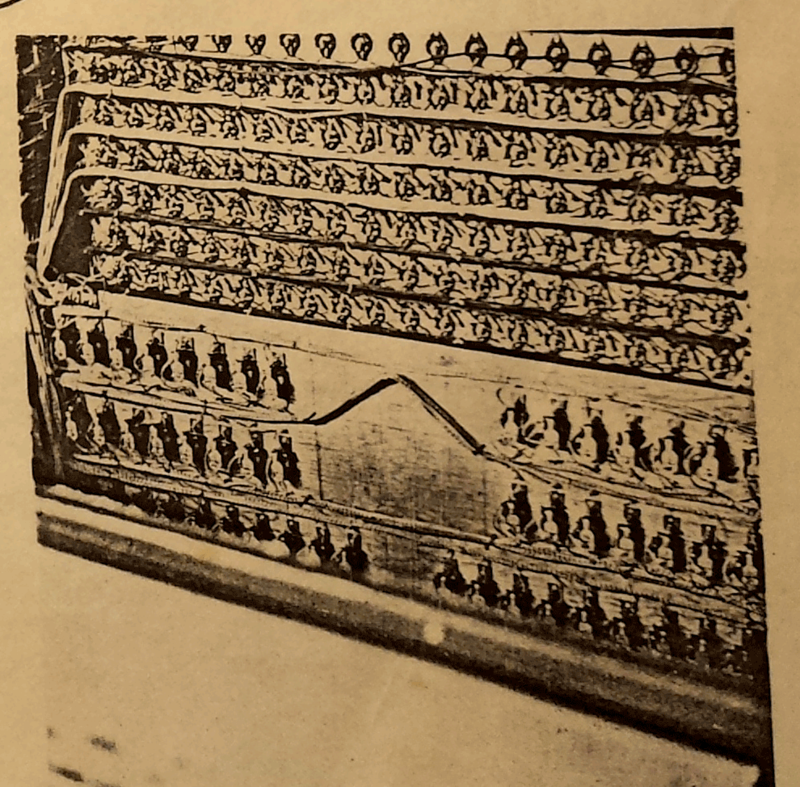 The length of the table defined the length of the piece, which on this model, consisted of 39 cards giving a maximum playing length of 96 bars. 1942 Photograph of the electronic scanning heads of the Hanert Electrical Orchestra. Photo; Private collection of Douglas Jackson 2017. The tones themselves were created by six separate banks of polyphonic vacuum tube generators similar in design to Hanert’s Novachord (USA, 1940). The instrument was also able to create percussive xylophone and drum sounds created by random (white noise) generators. Combinations of sounds could be defined on the notation cards allowing the composer to immediately switch instrument sounds as the piece progressed. 1942 Photograph of the tone generators of the Hanert Electrical Orchestra. Photo; Private collection of Douglas Jackson 2017. The difficulties inherent in the orchestral production of a composition may be compared to those which would confront an artist who found it necessary in painting a picture to destroy the complete or partially complete picture he was painting every time he became dissatisfied with any slight detail of the picture. The painter is not subject to such stringent regulation but instead merely repaints such minor portion of the whole picture which does not represent the subject being painted sufficiently accurately to meet his artistic approval…In the method and apparatus of this invention the composer, arranger, or conductor has at his command means for controlling the quality of each note, its intensity, intensity envelope, the degree of accent, duration, and tempo without necessarily affecting any other note or tone of the composition. 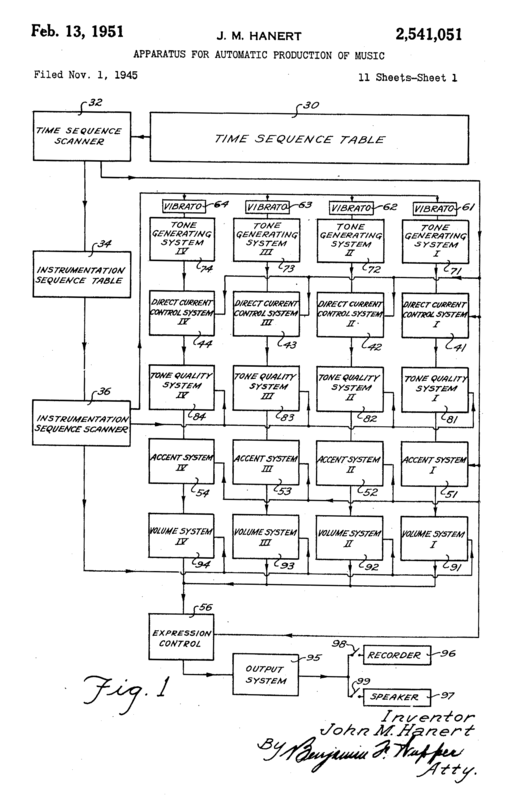 Diagram from Hanert’s patent describing the sequence of tone filters and processors. Despite its innovative qualities, the Electric Automatic Orchestra was never used commercially as Hanert had intended. In fact it seems that it was only ever used by Hanert himself and was not taken seriously by the Hammond company – who tended to humour Hanert’s ‘technical eccentricities’ in order to maintain his interest in more mundane but commercial designs. 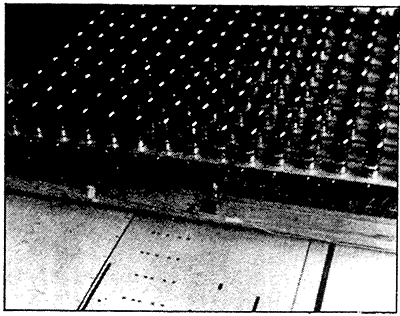 In addition to Hammond’s lukewarm support, the commercial failure of the project was also down to a combination of the synthetic nature of its sound, the inability of composers of the day to grasp the new musical paradigm the instrument offered plus the ever increasing capability and quality of recording technology– microphones, mixing desks, magnetic pick-ups, tape recorders – made the need for such a solution less pressing. The Electric Automatic Orchestra was sidelined and eventually mothballed by the Hammond company sometime during the 1950s. Shortly after the disappearance of Hanert’s machine, David Sarnoff, chairman of RCA corporation, commissioned a self-contained commercial music production machine that could mathematically analyse and re-synthesise pop music. What became known of as the RCA Synthesiser (the first time ‘Synthesiser’ was used in a musical context) was installed at the Columbia–Princeton Electronic Music Center and directly referenced Hanert’s work (8). 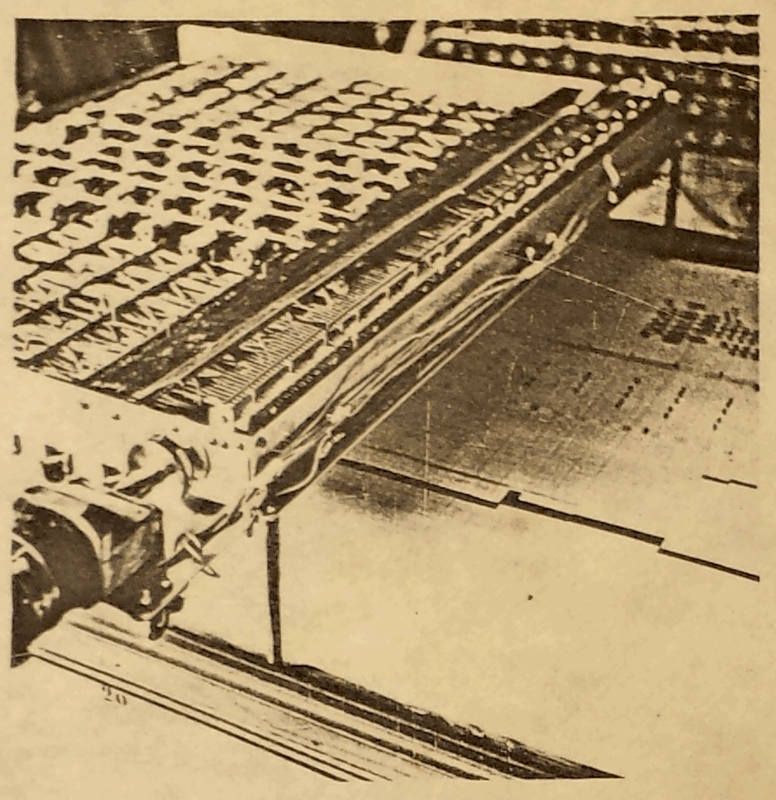 The machine used the same, though perhaps less flexible structure; a three stage process of music production – in this case a paper punch roll for composition, multiple banks of vacuum tubes for sound synthesis, and the same lacquer disc lathe for musical output. John Marshall Hanert was born into a German-American family on 18th March 1909 in Milwaukee, Wisconsin. 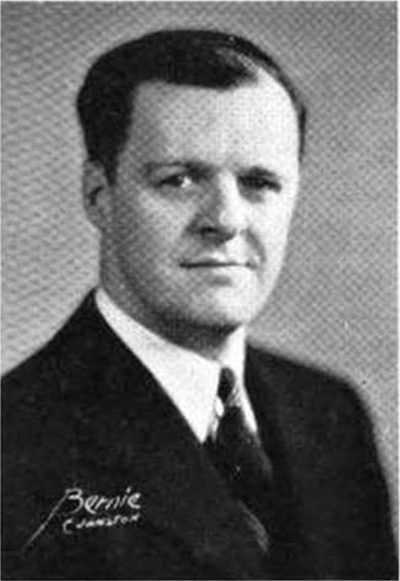 In 1932 Hanert was awarded a B.S. in Engineering and a BSE in Physics at The University of Michigan. An accomplished organist, Hanert had a special interest in electronic musical instruments and after graduation began working with Richard Ranger – inventor of the Rangertone Organ amongst other electronic musical devices – in New York on a Photo-Electrical musical instrument. In 1934 Hanert was appointed as the Head of Research at the Hammond Organ Inc in Chicago where he spent the rest of his life as the chief designer of all of Hammond’s instruments; Hanert became known as the musically untrained Laurens Hammond’s ‘Ears’.Hanert was the co-inventor on the first Hammond tone-wheel organ and inventor of the Solovox (1938) and Novachord (1939–42) one of the world’s first commercial synthesisers as well as many patents for vibrato and reverberation audio processors. Hanert continued working at the company After Laurens Hammond’s retirement in 1958 until he died on 23rd June 1962 at the age of 53 in a car accident near New Munster Wisconsin. Rhea, Tom. ‘The Hanert Synthesizer’ Electronic Perspectives, Contemporary Keyboard September 1979 p78. Suisman, D. Selling Sounds,The Commercial Revolution in American Music. Harvard University Press. 2012. Dolan, Brian. Inventing Entertainment: The Player Piano and the Origins of an American Music Industry. Rowman & Littlefield Publishers Inc 2009. Private collection of Douglas Jackson 2017.